Patrick Wilson & Zachary Levi Suit Up to Present at Tony Awards 2014! Patrick Wilson and Alessandro Nivola pose together backstage while attending the 2014 Tony Awards on Sunday evening (June 8) at Radio City Music Hall in New York City. 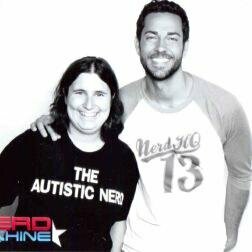 The hunks both presented on stage during the show that evening, as did Zachary Levi and Clint Eastwood. “Folks, if you get the chance in the next month, whilst in NYC, I highly recommend you go see the musical #FlyByNight. Simply delightful,” Zachary tweeted that day. Clint‘s appearance at the show was very appropriate as he is directing the new film Jersey Boys, a film adaptation of a recent Best Musical winner! FYI: Zachary is wearing a Brunello Cucinelli navy tuxedo with Max Verre “Black Patent Evening French Derby” shoes.